Rejected by a corporate petcare facility for daycare, Scooter finds a home at Hounds Town. Not all the phone calls that come through to doggie day care Hounds Town USA are good ones. It’s bound to happen when you work with so many local shelters and charities. Like the day Hounds Town Farmingdale received an upsetting phone call from the parents of a pup named Scooter. You see, Scooter isn’t an ordinary dog. A pug with personality, he is unable to use his hind legs. But that doesn’t stop this little guy. 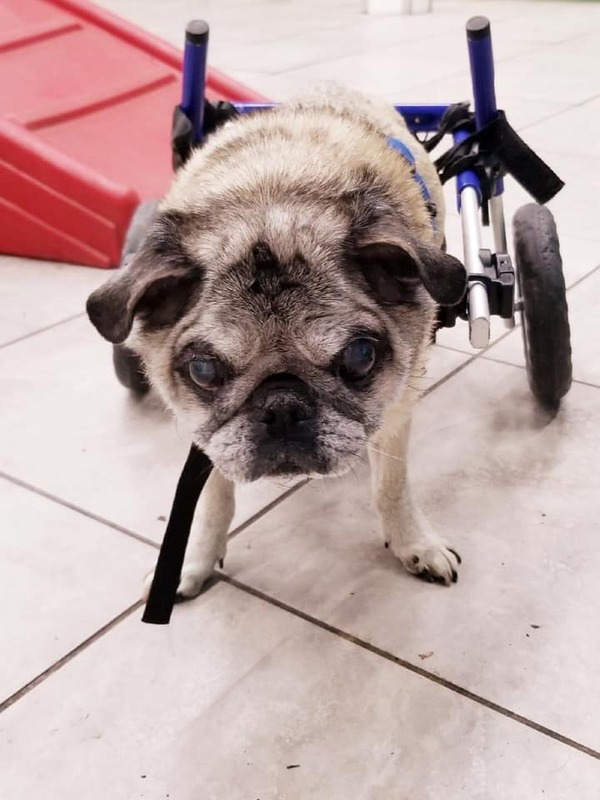 Outfitted with a wheelchair and true to his name, Scooter “scoots” along to explore the world. And he’s so full of love that he could melt any heart in the tri-state area! Scooter needs social interaction and exercise to thrive, just like all dogs. Isolation would be devastating to his physical and psychological health. And that’s exactly why Hounds Town Farmingdale was the perfect day care home for him. Caring dog parents who have rescued or adopted senior dogs, disabled dogs, or so-called “bully” breeds should feel comfortable dropping off their best friend, be it a pitbull or a disabled dog, like Scooter. The Hounds Town teams have all been trained by canine expert Michael Gould. Plus their strategic play groups organizes dogs by personality, energy level, and size, setting dogs up for social success. As for Scooter? He had a great time at Hounds Town Farmingdale, and his new dog pals didn’t mind his wheels at all.